In the shadow of Rotterdam’s better-known attractions – the VPRO Tiger Competition for new filmmakers, the flurry of CineMart deals, celebrity guests and hundreds of world premieres – a kind of mini-festival took place. For the first time, programmers chose to screen all 700 short films in a period of five days at the same venue. The condensed short film binge created a makeshift community of filmmakers, festival directors, critics and enthusiasts: people that you’d run into every day, which is quite a phenomenon in a festival that draws 385,000 visitors. Strange to pick sides so early in a festival; when I arrived I found myself forced to make a difficult choice between short films and, well, everything else. Foregoing the grand screens of the Pathé multiplex, I decided to park myself at the Venster/Lantaren theatre, with its noisy bar and endless unfurling of smoke, and work through as many of the shorts as I could. One of the major features of the short film program was the Starting from Scratch series, a kind of B-side collection of obscure Super8’s, classic and forgotten 16 mm films, live projections, musical accompaniments and international premieres. The program, which comprised seven screenings in all, was somewhat uneven, but featured some rare and wonderful surprises. Among these were the Filmische Materie films made by Schmelzdahin and Jürgen Reble. Like gleeful mad scientists, the Schmelzdahin Collective (including Reble) buried their films or hung them in trees to see what would happen, revelling in the destruction of the celluloid surface. The opening shot of Aus den Algen (1986), for example, shows a hand reaching into a frozen pond to retrieve tangled strands of 16 mm film, and then cuts to the water-logged footage itself, taken from Ali Baba and the Forty Thieves. Reble once said that he didn’t want to know too much about what would happen in his film experiments, cherishing the accidental and even destructive nature of what could happen. In this vein I also enjoyed Engels Smoking his Signature, Signing the Universe (1972), a restored video by Pieter Engels, who literally makes light of the art object when the dishevelled filmmaker signs his name on a piece of a paper, rolls it, smokes it and languidly blows out the smoke. The playfulness of Engels and the Schmelzdahin films stood in unexpected contrast to the earnest seriousness of the distributors who presented them. This year marked the third meeting of European experimental film distributors, the only gathering of its kind. 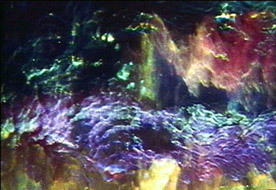 During the Preserving Artists’ Film and Video: Screening and Discussion program, distributors presented recently restored works from their collections, with a 35 mm print of Thierry Vincens’ Giraglia (1968), a dreamlike swirl of colour and music, making the strongest case for attending to the preservation needs of near-forgotten works. In recent years, distribution houses, not ordinarily equipped or funded to repair the works they represent, have nevertheless become de facto preservationists. With collections much broader than individual museums or archives, distributors like Light Cone, Video Data Bank and Filmform in Stockholm have taken on the care of fragile prints that get damaged, worn out or simply lost. Though no immediate solution was offered, the dialogue and collaboration enabled among normally small and isolated organisations was itself an achievement and a promise of cooperative efforts for times to come. As part of the drugs in cinema sidebar, White Light, the Los Angeles-based Center for Visual Music presented two programs: the first, Legendary Light Shows, a collection of vintage psychedelic films from the ‘60s and the second, films by Jordan Belson, including the European premiere of his newest work, Epilogue (2005). (Belson objected to his films being thought of as “drug” films and so his program is listed alongside the White Light group.) The Legendary Light Shows program drew on the explicit connection between visual and chemical hallucination, with actual film images that accompanied concerts by the Grateful Dead, Pink Floyd and others. The program concluded with an excerpt from David Lebrun’s The Hog Farm Movie (1970), an orgiastic, half-baked documentary in which a circus rolls into a dreary Midwestern town and proceeds to convince the locals to climb on top of each other to make a “pile with a smile”. An ambitious program, White Light attempted to marry films about drugs and films that simulate, in some way, the drug experience. Of the latter type, it seemed that abstract films, which have a long and varied history in their own right, were too generally lumped into this category. Perhaps the most awkward fit in the program was Jon Jost’s Passages (2006, world premiere), a love song for his estranged daughter, Clara. Passages could be considered an abstract film, since it is almost entirely comprised of nearly-still, video-processed images of foliage and water, but because the title cards give a summary of Jost’s bitter custody battle and mention that nearly every image was filmed with his daughter by his side, it is impossible to read these images as purely abstract. Rather, the gradual turning of seasons in the film resonates with Jost’s sense of loss and his hope that these images will eventually find his daughter. Vincent Grenier’s North Southerly (2005, international premiere) was the kind of film that should be shown without any introduction or program note. Its world is inviting but imposes little; the image which remains mostly constant throughout appears soft, like feathered brushstrokes, and it is not until late in the films that you recognise what Grenier is actually filming. The revelation matters little; North Southerly, like its title, is neither one thing nor another. It is an abstract film, and the revelation of its subject comes not as a simple gag, but a play on cinema’s fine border between real and imaginary. Errata: A Compendium of Errors (2005, European premiere), by Alexander Stewart, marvelously shows how a simple device – a photocopy machine and endless reams of paper – can result in magic. By copying copies, one generation after the next, the latent marks and smudges take on a life of their own. Their shapes grow heavy or fade as quickly as they appear, but what is most striking is their movement – liquid, intense and entirely unpredictable. Errata shows us the shadowed footprints of the ghost in the machine. 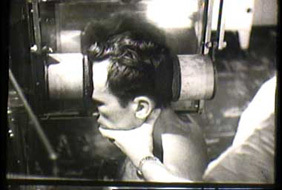 Found footage films made their way throughout many of the short film programs, from the satirical cut-up The Influence of Ocular Light Perception on Metabolism in Man and in Animals (2005), by Thomas Draschan and Stella Friedrichs, to the buoyed lift of the camera, riding on a wave in an iceberg-filled sea in Bill Morrison’s How To Pray (2005, world premiere). Morrison also had another film in the program, Outerborough (2005), a split-screen train journey dedicated to Ken Jacobs, who also exhibited two films at Rotterdam. Jay Rosenblatt’s Afraid So (2006, world premiere) was one of the most arresting films at the entire festival, juxtaposing the normally comforting voice of Garrison Keillor over a parade of found footage images. Marie Beaumont’s titular poem, read by Keillor, is composed entirely of questions, or more precisely, worries and doubts. “Could you lose your job? … Will it leave a scar?” Rosenblatt slyly pairs images with every line, from the literal (“Are we seeing the understudy?” – view of ballet dancer’s feet en pointe) to the darkly absurd (“Could this cause side effects?” – view of man’s head in a vise). His final image, which accompanies the question, “Can it get any worse?”, is the film’s most haunting, precisely because Rosenblatt shows nothing at all. Similarly, in her film, Dangerous Supplement (2005, world premiere), Soon-Mi Yoo uses archival footage of the Korean War to illustrate what is missing in representation. The mountain views that glide upward seem to do so purposefully, as if to avoid the villagers who are glimpsed only rarely. Yoo highlights the edges of the film frame by revealing the sprocket holes and the dust on the worn celluloid, so heavy that it makes every image appear to be snowing. At work in Yoo’s film is the tension between what is and isn’t seen, and the sly mediation of film by video. You get the sense that her selections are not made without weight, and that for everything chosen to be seen, something else is lost. One of the festival’s hidden gems was a small exhibition of films by Jaap Pieters at Centrum Beeldende Kunst. I was surprised to find Pieters there, projecting his 8 mm films and offering his viewers tea in between screenings. Many of his films were shot through his Amsterdam window: humble, single reel portraits of the people he saw passing by. The voyeuristic nature of his films is complicated by the subjects he chooses – generally homeless people so lost in their own worlds that they are oblivious to Pieters’ camera. What is perhaps more remarkable is the way these people are almost completely invisible to the other people on the street. In Stringless (1994), for example, a man vigorously plays an unstrung ukelele on a crowded street, and aside from a young girl who stops to pose for Pieters’ camera (she is immediately pulled away by her mother), there are few who even glance at the self-imagined virtuoso. Pieters waxes philosophical in The Tin Can Man (1991), where a drunkard stumbles around a deserted street, filling his pockets with beer cans, which, because his pockets are full of holes, immediately fall out. He continues to pick them up, either unaware or unconcerned that they are the same cans he’s been collecting. Lonely and absurd, the film stirred its viewers to laughter and compassion by transforming the absurd into the epic, and making visible the unseen. Dear Mother (1998), by Nose Daisuke, is similarly aware of being seen – giant Japanese characters are pasted to a wall on a sidewalk – as the letter in the film attempts to reach out to the author’s mother, but stops short of full expression. We know from reading the letter that several years have passed without communication between the author and his mother. “Thank you for sending hams. I just have to ask one thing,” reads one frame, and then, instead of asking a question that probes into the silence of those lost years, the letter continues, “but why is it always hams?” The film, likewise, seems hesitant in what it wishes to reveal, the frame at first filled with letters and only gradually pulled back to reveal the heads of passersby. I saw several films that could be said to be self-aware, that is, concerned with the act of filming itself. The best of these were magical and mysterious, for they accentuated the tension between seeing and believing. The humorously dry narrative in Desi’re – the Goldstein Reels (2005, international premiere) methodically attempts to qualify the found footage onscreen as that of artist Jack Goldstein. 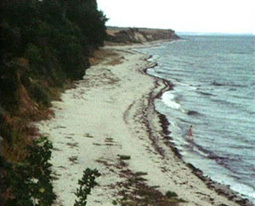 At the end of the film, the camera acts as if startled, turning abruptly to the faraway image of a woman walking out to sea, and who never again emerges. Igor and Gleb Aleynikov’s Revolutionary Sketches (1987) giddily proclaims the birth of a new Soviet underground cinema, but their awkward stances and homemade glasses, which obscure their faces, seem to suggest that the act of filming was not without cost. The mystical seeps into the real in Apichatpong Weerasethakul’s Worldly Desires (2005), a short digital film that stages the shooting of a film in the jungle of Thailand. The couple in the film is in search of a mythical tree while the crew, chatting quietly in between takes, follow them into the deep jungle, where, at night, crickets sing and pop singers dance silently in the dark. And a tribute to the late experimental documentarian Mark LaPore included the international premiere of Kolkata (2005), a portrait of a city which LaPore described as both “medieval and modern”: child mannequins, flooded streets and young tightrope walkers. In the film’s most powerful scene, a long tracking shot, the camera is pulled through a busy market, and only for a moment, in the broken shard of a mirror, do we see LaPore crouching behind a camera on the back of a cart, visible to all. Perhaps most affecting of Rotterdam’s films were those that, like the glimpse of LaPore in Kolkata, revealed something of the maker. The Vita Brevis sidebar featured a wide range of biopics, including no less than three films about William Eggleston and an overwhelming selection of films about filmmakers. The two films featuring the lives of legendary (and sometimes notorious) avant-gardists, Marie Menken and Jack Smith, were disappointingly dull, and in both cases, it was only the retrieval of lost footage that redeemed them, though I would have preferred to have seen the original films in their entirety. Case in point: even the title for the Marie Menken shorts program, Go! Go! Go!, gave a better sense of the filmmaker than the movie made about her (though the diaristic style of Martina Kudlácek at least brought a sense of delicacy to Notes on Marie Menken [2006, world premiere], rather than the Biography Channel feel of Mary Jordan’s Jack Smith & The Destruction of Atlantis [2006, world premiere]). Which begs the question: do biopics about experimental filmmakers need to be experimental in their own right? Mike Hoolbloom’s Fascination (2006, world premiere) certainly makes the case, tangentially documenting the life and work of Toronto video artist Colin Campbell. Here, the subject, an artist whose life and ever-shifting identities were caught up with the medium he was using, is perfectly matched to Hoolbloom’s portrait, which features found footage documentation of atom bomb testing, dispersed voiceovers (one, humorously, features a boy speaking about the elusive nature of the image), elliptical inclusions of Hoolbloom himself and glimpses of the Campbell in portraits of his friends and lovers. Hoolboom also curated a program of shorts, which included one of the best films I saw at the entire festival, Dani Leventhal’s riveting video diary, Draft 9 (2003). The craft of montage is alive and well in Leventhal’s work: delicate and harrowing juxtapositions of skinned animals, the tattooed arm of a Holocaust survivor eating donuts in a coffee shop, neon flowers on a disco floor. In her work emerges something that is extraordinarily immediate, both fresh and painful, hard to watch and yet impossible not to watch. As another take on the film diary, Alain Cavalier’s Le filmeur (2005) is a moving portrait of ten years of his life that includes the death of his parents and his own struggle with cancer. The camera here is its own character, a devoted companion, entranced with the views from hotel windows and passing cats. In one telling scene, however, Cavalier focuses his lens on his sleeping wife and, whispering to the camera, he inadvertently wakes her. Visibly startled, she pleads with him to turn the camera off. On a still-dark morning in Rotterdam, late in the festival, I sat in a cave-like theatre at Cinerama, awaiting the first screening of the day: Hito wa inai (Clear People) (2005, international premiere), by Ohuchi Shinigo. Festival programmer Gertjan Zuilhof introduced the film with uncharacteristic awe, almost as if he were sharing the first film experience of his life. “This film,” he said, “is filled with light.” Shinigo’s film, one delicate composition after another set in a housing project in a Japanese suburb, quietly captures that light, but only rarely sheds it on its characters. In darkness, they listen to confessions and stories read aloud over the radio and reveal little to us. The lightness Zuilhof spoke of, the permanent sun in Shinigo’s summer, could have very well been the light of cinema itself: flashes of brilliance in shadowed rooms.